I’d classify this book as one that ultimately worked, but it had some weaknesses. My main problem was that Random Revenge by William Michaels doesn’t roll out in optimal fashion. It’s sort of a Columbo story, where in the first half you see the crime committed, and in the second half you watch the detective solving the crime. The problem here was that we spent that first half mostly with the criminal and victim, who were both unpleasant enough to make the going tedious. One of them (I won’t say whether they’re murderer or victim) is Melanie Upton, a ruthless, aspiring actress with very few sympathetic qualities. The other is Lenny Gruse, a ruthless, aspiring paparazzo with no sympathetic qualities at all. I got a few glimpses of our hero, Detective Robert Winter, within that section, and his appeal was all that kept me with the book. The second half, where he takes center stage, is much better. 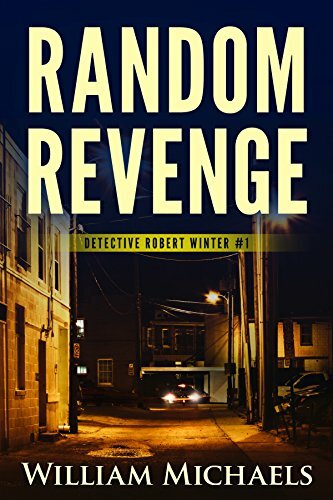 Winter, a detective in a small Massachusetts town where a movie is being filmed, is another in a long list of fictional “loose cannon” cops, but he’s original enough to make him interesting. He’s impatient of regulations and protocol, but he has a very high clearance record. And he’s not above doling out a little street justice. His method is to follow his instincts, but also to think a lot. He has a genius for playing out a multitude of possible scenarios in his head, making connections other cops wouldn’t make. He’s not like Columbo in the genius department – Columbo usually knew who was guilty from square one. Winter tries out and rejects a thousand theories before finding one that works. It’s the genuine scientific method. The ending of the book was surprising, but not out of the blue, in light of what we’ve learned about Winter. His idea of closing a case isn’t always precisely the same as what the law prescribes. Random Revenge started slow, but worked well once it got going. Cautions for adult themes and language, and some moral ambiguity. There were moments of sloppy writing. But I’d like to read the next book in the series (I trust one is coming), because I think Detective Robert Winter might have a big future.